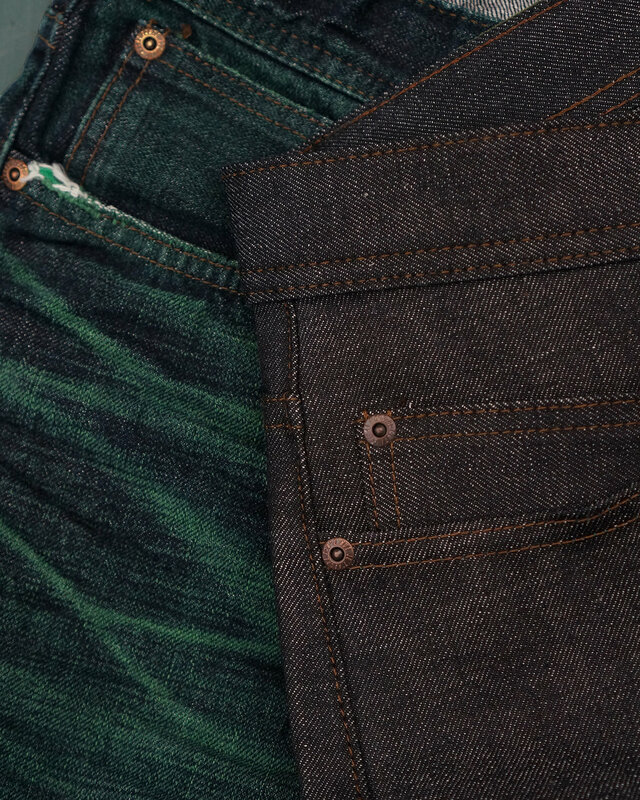 Green Core Selvedge is a 12.5 Japanese Selvedge Denim designed to fade to green! Traditional rope dyed denim fades from indigo to white. The reason being, the rope dying method dyes only the outer most layer of a white cotton strand leaving the core of the yarn white. So as the indigo fades from the yarn, it will eventually reveal the white core. For the Green Core Selvedge we start with permanently dyed green yarns that are then rope dyed. The result is a perfectly dark indigo jean that over time fades to green. Other details include classic redline selvedge ID, green pull up leather patch, brown contrast stitching, green pocket bags, and dark copper buttons and rivets. Available in Weird Guy, Super Guy and Easy Guy.